The Northern Awards Dinner will be returning to The Principal Manchester for its eighteenth’s Regional Awards Dinner. With its striking Victorian architecture, The Principal Manchester is an unmistakable landmark in the city's skyline and will again provide the perfect setting for the celebrations. Guests will enjoy pre-dinner drinks and will then be seated for a 3-course meal, followed by entertainment from a guest speaker and the announcement of this year’s regional winners. 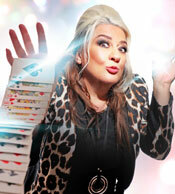 Comedian and magician Mandy Muden, an award winning member of the inner magic circle, has performed cabaret for many years and is also an actor and script writer. Last year she impressed the audiences and judges of Britain’s Got Talent, taking her to the semi-finals. With a striking personality and a razor-sharp wit, she has been invited to perform all over the world, from comedy clubs to cruises to Buckingham Palace.